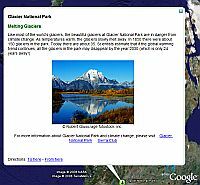 Using Google Earth, teachers can fly their students around the world to talk to them about issues like climate change and how it has affected places like Glacier National Park, the Chesapeake Bay and Los Angeles. And they can introduce students to community initiatives across the country where volunteers are cleaning up their cities, planting trees and beautifying. Using Google Earth, teachers can show their students placemarks of the towns where outreach projects are taking place and students can get involved in cleaning up their own environment. There's also a contest for students to write their own environmental stories illustrated with Google Earth images. They are sending 30,000 posters to middle school teachers and e-mailing another 100,000 teachers about it as well. Here's the Scholastic web site for teachers, and a special Google Earth Day page as well. At those pages, you can download one of the lessons for Google Earth like Lesson 1 - Climate Change .